Does every one suffer from hearing loss with increasing age? Can earplugs reach the eardrum and cause damage to the eardrum? Can our ears get infected by using earplugs? Will the use of hearing protectors hamper the ability to hear important sounds? How long can someone be in a loud noise before it's hazardous? How can one tell if a noisy situation is too loud? If I already have hearing loss and wear a hearing aid, still do I need to protect my hearing? How long does an infection in the ear last after swimming? Can it lead to some permanent damage? Sometimes ears feel blocked from the inside. What is the best way to clear them? 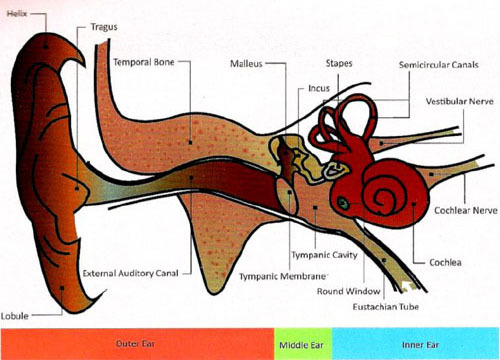 What is the indication of placement of tubes in the eardrums? Can certain medicines cause hearing loss? What is the cause of itching in the ears? Why does my child get pain in the ear? How can I prevent ear infections in my child? How can I keep his/her ears clean? What can I put in his/her ears? When should I take the child to the doctor? Can I use traditional/herbal remedies in the ear? Why can't I understand my child when he/she talks? My child can't hear properly, what should I do? I feel that my little baby does not hear properly. What should I do? How long can I wait before getting the hearing of my child checked? The doctor has advised my child to use hearing aid. What is the minimum age when hearing aid should be given to children? Can my deaf/hard of hearing child go to school and learn? Can my deaf child grow up to be a normal citizen? Q. How do we hear? A. Hearing depends on a sequence of events that change sound waves in the air into electrical signals. Our auditory nerve then carries these signals to the brain. Sound waves enter the outer ear and travel through a narrow passageway called the ear canal, which leads to the eardrum. The eardrum vibrates from the incoming sound waves and sends these vibrations to three tiny bones in the middle ear. These bones are called the malleus, incus, and stapes.The bones in the middle ear amplify, or increase, the sound vibrations and send them to the inner ear-also called the cochlea-which is shaped like a snail and is filled with fluid. An elastic membrane runs from the beginning to the end of the cochlea, splitting it into an upper and lower part. This membrane is called the "basilar" membrane because it serves as the base for key hearing structures. The sound vibrations cause the fluid inside the cochlea to move, and a traveling wave forms along the basilar membrane. Hair cells on top of the membrane move with this wave. As the hair cells move up and down, their bristly structures bump up against an overlying membrane and tilt to one side. This tilting action causes pore-like channels, which are on the surface of the bristles, to open up. When that happens, certain chemicals rush in, creating an electrical signal.The auditory nerve carries this electrical signal to the brain, which translates it into a "sound" that we recognize and understand. Q. Does every one suffer from hearing loss with increasing age? A. Most people's hearing gets worse as they get older. For the average person, aging does not cause impaired hearing before at least the age of 60. People who are exposed to noise and do not protect their hearing begin to lose their hearing at an early age. Also some conditions like diabetes mellitus, hypertension etc. may be associated with early onset hearing loss. Q. Can earplugs reach the eardrum and cause damage to the eardrum? A. Length of the average ear canal is 24mm. The typical ear plug is between 1/2 to 3/4 of an inch long. Also the path from the opening of the ear canal to the eardrum is not straight. The irregularity of the canal protects the ear drum from injury. Q. Can our ears get infected by using earplugs? A. Using earplugs will not cause an infection. Have clean hands when using earplugs that need to be rolled or formed with your fingers. Do not touch the part that goes into the ear canal. Q. Will the use of hearing protectors hamper the ability to hear important sounds? A. Hearing protectors lower the noise level of the equipment and do not eliminate it. There are noise-activated hearing protectors that allow normal sounds to pass through the ear and only "turn-on" when the noise reaches hazardous levels. There are even protectors that professional concert musicians use that can lower the sound level while retaining sound fidelity. Q. How long can someone be in a loud noise before it's hazardous? A. The degree of hearing hazard is related to both the level of the noise as well as to the duration of the exposure. Q. How can one tell if a noisy situation is too loud? A. There are two rules: First, if you have to raise your voice to talk to someone who is an arm's length away, then the noise is likely to be hazardous. Second, if your ears are ringing or sounds seem dull or flat after leaving a noisy place, then you probably were exposed to hazardous noise. Q. How often should hearing be tested? A. Anyone regularly exposed to hazardous noise should have an annual hearing test. Also, anyone who notices a change in his/her hearing, or who develops tinnitus; should have his or her ears checked. Q. If I already have hearing loss and wear a hearing aid, still do I need to protect my hearing? A. If you have hearing loss, it's important to protect the hearing that you have left. Loud noises can continue to damage your hearing making it even more difficult to communicate at work and with your family and friends. You need to protect your ear from trauma, ototoxic drugs and infections. Q. How long does an infection in the ear last after swimming? Can it lead to some permanent damage? A. Ear infections (swimmers ear) will vary in severity and duration. Most ear infections do not cause permanent damage as long as they are treated properly and in a timely fashion. Q. Sometimes ears feel blocked from the inside. What is the best way to clear them? A. Ears can be blocked due to a number of different causes. The external ear canal can be blocked with earwax or a small foreign object. Earwax is normal in the ear canal but sometimes it accumulates and completely blocks the canal. Foreign objects should never be put into the ear canal. These types of blocks can cause hearing difficulty and discomfort, and must be removed. Another type of blockage in the ear can occur in the middle ear, which is most often caused by an ear infection and fluid. In both cases it is important to see a doctor who will diagnose the problem and prescribe the correct treatment. Q. What is the indication of placement of tubes in the eardrums? A. Many small children need to have tubes placed in their ears because of recurring ear infections. These tubes equalize the pressure between the external and the middle ear and help in draining out of fluid from the middle ear. Most tubes are automatically extruded after a period of time (6 months to 2 years). If the child still has recurring ear infections, they may have another set of tubes inserted in their ear drums. Q. Can certain medicines cause hearing loss? Gentamycin, Streptomycin, Frusemide, Chloroquine, Aspririn and many others. These medicines must be used only upon the prescription of a qualified doctor. Q. What is the cause of itching in the ears? A. The common causes are fungal infection, allergy, chronic dermatitis of the canal and eczematous otitis externa. After examination suitable ear drops are prescribed. Q. Why does my child get pain in the ear? A. The pain in the ear can be caused by problems such as impacted wax in the ear, acute infection in the ear canal, acute infection of the ear drum or because of fluid in the middle ear. In order to identify the problem, the child should be taken for an ear check up. The child must be taken to an ENT specialist. Ear pain should not be ignored as it can lead to serious problems. Q. How can I prevent ear infections in my child? Early diagnosis of ear infections by staying vigilant for problems like pain in the ear, decreased hearing and wetness in the ear. Educating the child not to put anything into the ear such as pencil, erasure pieces, hair-pin etc. Q. How can I keep his/her ears clean? A. The ear is a self cleaning organ and does not require any active cleaning. Ear buds should not be used and proper hygiene of the ears should be maintained. Q. What can I put in his/her ears? A. Do not insert or put anything into the ear. Do not use any oil, sticks, pins etc because these can lead to infection in the ear. Q. When should I take the child to the doctor? If the child does not understand what you say properly. Consult your pediatrician or an ENT specialist. Q. Can I use traditional/herbal remedies in the ear? A. NO. These things may irritate the ear canal and the ear drum and cause infection in the ear. Q. Why can't I understand my child when he/she talks? Q. My child can't hear properly, what should I do? hospital, so that thorough ear check up and hearing assessment can be done. The doctor will be able to guide you regarding the need for treatment. Q. I feel that my little baby does not hear properly. What should I do? A. If you have any such suspicion, you must get the hearing checked at the earliest and set your doubts to rest. Take the child for a hearing check up to the District hospital at the earliest. Hearing can be checked with a simple and painless technique. Q. How long can I wait before getting the hearing of my child checked? A. In case your child has deafness, he must be diagnosed and treatment started by the age of 6 months. The earlier that is done, the better it is for the child, so that he can learn to understand, speak and study, just as other children of his age. Hearing test is easy and painless. Undue delay can lead to improper speech development. Q. The doctor has advised my child to use hearing aid. What is the minimum age when hearing aid should be given to children? A. If your child has hearing loss and has been advised to use hearing aids, you must get the child the hearing aid at the earliest and make sure that he/she uses it. 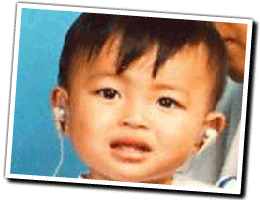 No child is too small to use a hearing aid and even a 6 month old child can start using one. Use it as per instructions from the Audiologist or doctor at the District hospital. Q. Can my deaf/hard of hearing child go to school and learn? A. If hearing impairment is the only problem your child has, and you have started the treatment as per guidance of the doctor, the child can be rehabilitated and can then go to school and get educated just like other children in the community. However, this will require intensive training and therapy of the child and serious commitment and participation from the parents. Q. Can my deaf child grow up to be a normal citizen? Involvement and commitment on behalf of the parents, teachers and trainers. With proper and timely treatment, the child can learn to speak, communicate and can study and do a job just like the others.